Indicates two soul mate lovers who are finally allowed to just enjoy each other. All lessons are done and dusted, and the karma is cleared. When the World card appears in a Tarot reading, you are glowing with a sense of wholeness, achievement, fulfilment and completion. A long-term project, period of study, relationship or career has come full circle, and you are now revelling in the sense of closure and accomplishment. This card could represent graduation, a marriage, the birth of a child or achieving a long-held dream or aspiration. You have finally accomplished your goal or purpose. Everything has come together, and you are in the right place, doing the right thing, achieving what you have envisioned. You feel whole and complete. Now, the World card invites you to reflect on your journey, honour your achievements and tune into your spiritual lessons. Celebrate your successes and bask in the joy of having brought your goals to fruition. All the triumphs and tribulations along your path have made you into the strong, wise, more experienced person you are now. Express gratitude for what you have created and harvested. Finally, make sure you don’t rush into the next big project; celebrating your journey will set you up for success when you are ready for your next challenge. If you have not quite reached this point of completion, then you are very close! You may still need an added level of understanding to graduate to a higher level and enjoy real success. Look back at your past experiences and acknowledge how far you have come and what you learned along the way. It may surprise you to look back at your progress and see how much you achieved. This reflection may also be what you need to bring your project to its final stages. 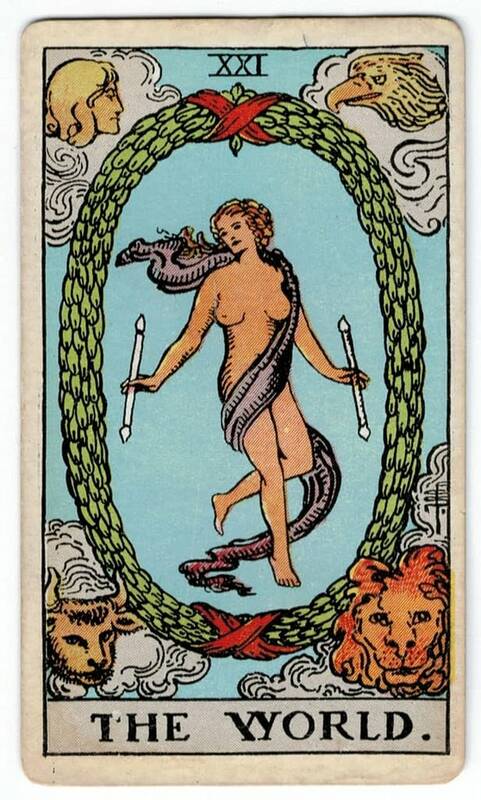 If loose ends still remain, the World card asks you to bring them to completion. In doing so, you will clear the space for new beginnings and opportunities to emerge. More literally, the World can mean world travel, particularly on a large scale. You may be lucky enough to embark on a six-month overseas trip, or are working, studying or living overseas for an extended period. This card reinforces Universal understanding and global awareness, and you will you will find a new appreciation for people and cultures from across the world. The reversed World card suggests that you are seeking closure on a personal issue. Perhaps you are still emotionally attached to a past relationship and want to move on. Or you dream of the day you can fit into your old skinny jeans but realise now that your metabolism and body shape changed in the last ten years. You know, deep down, that to accept and embrace where you are now, you need to let go of the past and move on. Finding closure may be an intensely personal journey – something you manage through journaling, visualisation, energy work, and therapy. The World reversed can signify that you want to fulfil a big goal or complete a big project, but you’re not taking all the steps necessary to get there. You may opt for the easiest or quickest path to attain your goal, but it won’t lead to the outcome you intend. Climbing a mountain from the bottom up is an entirely different experience from getting a helicopter ride to the peak, even though the destination is the same. You need to experience the trials and tribulations along the way so you can learn and grow. And when you do reach your goal, you will enjoy such a fantastic sense of achievement. Don’t be afraid to set stretch goals for yourself, even if it means enduring hardships or challenges along the way; it will make the victory even sweeter. The reversed World can also indicate a time when you are close to finishing a project or goal, but for whatever reason, you lose focus and slack off right at the end. You only have a short way to go, so why stop now? Re-energise and remind yourself how wonderful life will be when you get the thing you’ve wanted for so long. Sometimes, the reversed World can mean a frustrating delay in completing your projects. You might miss an essential piece, and you won’t find closure until it gets worked out. You may need to get more creative to figure out how to touch the finish line.